Translucide Glaze – Just add paint! Create your own Tinted Glaze by mixing with Maison Blanche Paint Company’s Antique Furniture Paint! 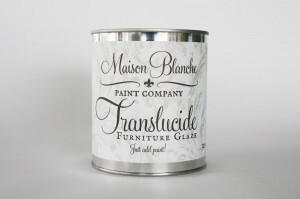 Translucide Glaze Medium was developed for use over absorbent surfaces such as Maison Blanche Paint Company’s Antique Furniture Paint. Translucide has a very long “open time” allowing you to easily achieve a custom glazed finish. Translucide is water based and dries to a Matte finish. Translucide is also suitable for walls! Application: Start by adding 1 part Maison Blanche Paint Company Antique Furniture Paint to 6 parts Translucide. Can also be tinted with Universal Colorants, artist’s acrylics, or latex paint. You can add more or less paint depending on how translucent you would like your glaze to be. The less paint you add-the longer your “open time”. Mix well! Apply to your painted (unwaxed) surface with a brush then wipe back with a soft cloth to your desired effect. For a Strie effect, apply tinted Translucide and then brush through it with a coarse paint brush to create a soft and natural striped finish. Create a linen effect by applying Strie finish in two directions. Try sponging it for a mottled, stone look. For a very subtle glazed look and less “bite” try applying a coat of Untinted Translucide to your surface first and let it dry completely before applying a coat of your Tinted Translucide Glaze. For added protection finish with Maison Blanche Paint Company Satin or Matte Varnish. Alternatively, you can finish with Maison Blanche Paint Company’s Antique Furniture Wax. Soap and water cleanup. 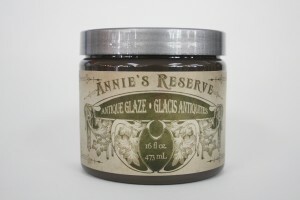 Annie’s Reserve Antique Glazes were developed by artist Annie Omar. Annie chose these special colors from her own private collection of color recipes that she developed over many years as a decorative painter. These tinted gel glazes dry to a satin finish and are water-based, Annie’s Reserve can be used on furniture and walls to create an aged appearance as well as accent ornate detail on furniture or moulding. Application: Apply thin layer with a brush or roller. While gel is wet, gently manipulate with brush or graining tool, sea sponge or soft cloth. For a smooth even effect, wipe with a damp sponge in the same direction as the wood grain.